Hardwell & DallasK, Vigel, Holl & Rush vs Tome & Jame, Alpharock & JAGGS, Mamik and more. Hello everybody! Let&apos;s party for the PEACE DAY! My name is Elena and I am writing as the Set for Peace initiative coordinator at Peace One Day. 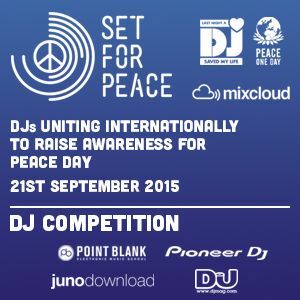 We would like to thank you so much for taking part to the Set for Peace 2015 Mixcloud Competition. This year there have been over 380 participants from all over the world. It would be fantastic if you could send us an email at [email protected] , so that we can be in touch with you in the future regarding the Set for Peace initiative and competitions. Thank you so much! I&apos;ve already email with the following address [email protected] . Thanks bro! Appreciate a lot! Your mix are great as well! Good luck to you too :D had favorite it bro!